Who Was Lyman C. Hunt? Lyman C. Hunt was born January 3, 1891 in a farm in Fairfax, Vermont. He went to a one-room school until high school, 1904. Lyman graduated in 1908 from Bellows Free Academy in Fairfax, Vermont. In June of 1912, Hunt received his A.B. degree at U.V.M., and received his Master’s Degree in 1938 at Columbia Teachers College. 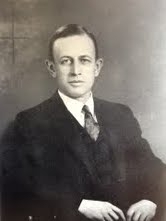 In 1912, Hunt began his teaching career at McIdoes Falls, Vermont and then moved on to McIdoes Academy, where he was principal, coach and janitor. Lyman C. Hunt was also principal of Champlain High School in New York, Peoples Academy of Morrisville, Vermont and Spaulding High School in Barre, Vermont. Mr. Hunt served for 35 years from 1922-1970, as Burlington’s Superintendent of Schools, and was in this position the longer than any other superintendent in Vermont. In 1965, he was Essex’s representative who helped develop legislation. In his efforts to advance education, both locally and in the region, he displayed integrity, good judgement, patience, tact, and perseverance: yet remained modest, quiet and unassuming. After his death in 1970, the new junior high school in the New North End was named after Lyman C. Hunt and then was changed into a middle school in 1987.